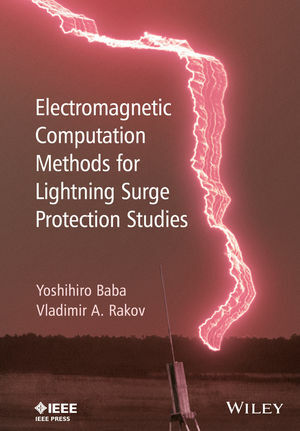 This book is the first to consolidate current research and to examine the theories of electromagnetic computation methods in relation to lightning surge protection. The authors introduce and compare existing electromagnetic computation methods such as the method of moments (MOM), the partial element equivalent circuit (PEEC), the finite element method (FEM), the transmission-line modeling (TLM) method, and the finite-difference time-domain (FDTD) method. The application of FDTD method to lightning protection studies is a topic that has matured through many practical applications in the past decade, and the authors explain the derivation of Maxwell’s equations required by the FDTD, and modeling of various electrical components needed in computing lightning electromagnetic fields and surges with the FDTD method. The book describes the application of FDTD method to current and emerging problems of lightning surge protection of continuously more complex installations, particularly in critical infrastructures of energy and information, such as overhead power lines, air-insulated sub-stations, wind turbine generator towers and telecommunication towers. Professor Baba received his PhD from the University of Tokyo. He was Visiting Scholar at the Lightning Laboratory at the University of Florida, USA, and is currently Editor of the IEEE Transactions on Power Delivery. His areas of interest include computational electromagnetics, electromagnetic compatibility and lightning protection. Professor Rakov studied for his PhD at Tomsk University in Russia and has written extensively on the subject of lightning in numerous international journals and conference proceedings. He is A Fellow of the IEEE and a Fellow of the American Meteorological Society, amongst others, and his areas of interest cover lightning, lightning protection and atmospheric electricity.